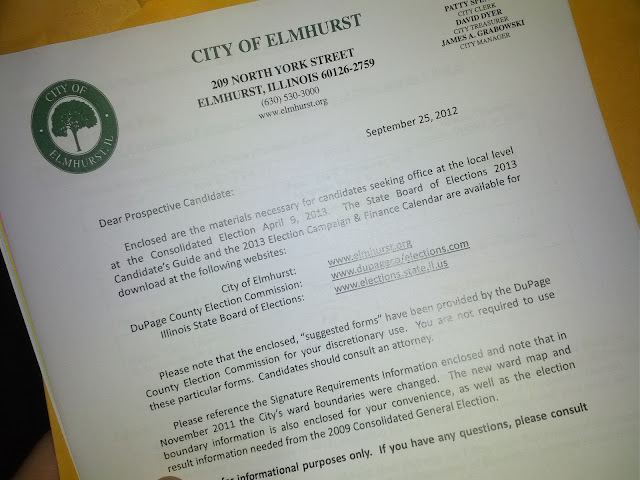 The City of Elmhurst has an important election coming up on April 9, 2013. In addition to electing a new Mayor (our Mayor won a seat on the County Board and is resigning from the City post in December), we're also going to be electing Alderman across all 7 Wards, City Clerk and the City Treasurer. After hearing from residents and neighbors as well as talking with my wife, I've begun weighing the decision to get back involved in local government. Last week, I went to City Hall and picked up a packet and have begun to circulate the petitions to 3rd Ward residents. I've long believed in "Citizen-Government" where individuals from every walk of life stand up to serve our government - at all levels - for a period of time, upon which they go back to their chose professions. The idea of a career politician was never considered by the founders of our country. I've served as a Trustee in the Village of Frankfort for six years and on the Frankfort Park District Board of Commissioners for two years. I gave my time and service and then went back to my profession and family. I support candidates who share that philosophy. I'll be frank: times are tough in Elmhurst. We've raised taxes and fees on residents and had to make tough decisions on services and cuts. But, more can be done. The newly seated City Council will be making tough decisions that will impact not just the next 5 years, but the next 50 years. Between the City Centre plans, TIF District decisions, service levels across the board, and the expansion of our tax base through commercial and light industrial development, the new Mayor and Council will set the direction for the next generation of Elmhurst residents. The 3rd Ward is represented by two dedicated, hard-working Alderman in Dannee Polomsky and Michael Bram. In thinking about the future of our city, it is plain to me that the way forward can't always be "no". Residents of Elmhurst want our government to bring common-sense solutions and creative approaches to solving our problems while limiting the size and scope of our local government. We also want a responsive local government. There is no closer unit of government than municipal and we want transparency and honest, open communications. The line about "You can't fight City Hall" needs to be turned on it's ear. We want an Alderman who "Is fighting for us at City Hall." I intend to listen to my family (first!) and my friends and neighbors as I circulate petitions. Once we secure enough petitions to gain ballot access, we'll be able to have a solid conversation about whether there's a desire to have me enter the race for the 3rd Ward in 2013.